Central Jakarta Bina Marga Sub-dept. 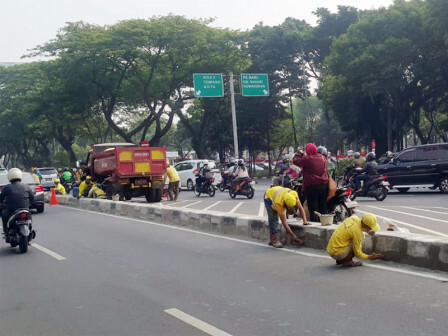 has replaced road dividers between Jalan Majapahit and Jalan Abdul Muis, Gambir.
" Due to road elevation, road dividers become more shorter and many vehicles break through it"
"Due to road elevation, road dividers become more shorter and many vehicles break through it. Thus we will replace and elevate it," said Sukowibowo, Head of Central Jakarta Bina Marga Sub-dept., Thursday (8/30). "It still has a same length. We just replace the old road dividers with the new one," he stated. Along 30 meters road has been elevated since two days ago. "Our target is to finish it next week," he conveyed.